On August 27, 2017, the 13th Foreign Language Bible Preaching Contest was held at the Okcheon Go&Come Training Institute. 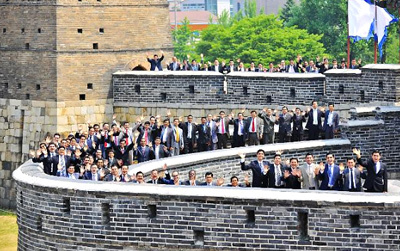 After the contest in March, this was the second one of the year; over 5,000 participants who were dreaming of overseas mission for the completion of preaching to seven billion people, including the pastoral staff members, attended to examine their foreign language skills, heating up their fervor. Zions have been established one after another due to the increased number of brothers and sisters. On July 25, 2017, three churches in Korea held the dedication ceremonies: the Gongju Church and the Jiksan Church in Cheonan, both in South Chungcheong Province, and the Sosabeol Church in Pyeongtaek, Gyeonggi Province. 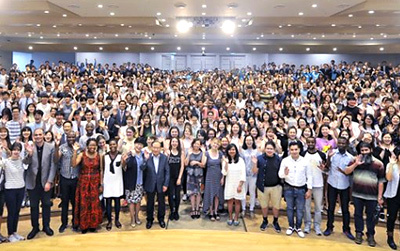 On July 16, the 2017 Summer Youth Character Education was held at New Jerusalem Pangyo Temple in Korea. 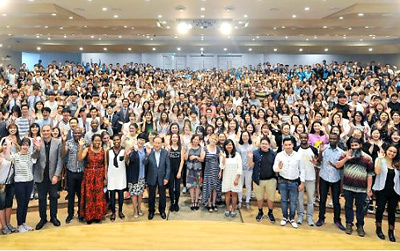 In the education Mother chaired, based on the Bible, more than 2,500 middle or high school students in Gyeonggi Province, the pastoral staff, and teachers ofstudent groups participated. On May 25, 2017, the Ascension Day Service was held in the Churches of God worldwide to commemorate Jesus’ Ascension. Ten days later, the Sacred Assembly of the Day of Pentecost was held on June 4. Another home of gospel has been added to shine the light of the truth in Incheon, the gateway of Korea to the world. The Ganseok Church in Incheon has been established at Namdong-gu, the center of administration in Incheon, where Incheon City Hall and Incheon Metropolitan Office of Education are located. Just as it was commanded by Jesus and written in the Bible, the Sacred Assembly of the Passover was held in the Churches of God all around the world in the evening of April 10 (the fourteenth day of the first month by the sacred calendar). On the following day of the Passover (April 11) and on Sunday (April 16), the Sacred Assemblies of the Feast of Unleavened Bread and the Resurrection Day were held in a godly manner according to the regulations of the feasts. On March 22, a week before the New Year’s Day by the sacred calendar (March 28), General Assembly 2017 started at the New Jerusalem Pangyo Temple with the Holy Spirit in the presence. The General Assembly was for reporting the gospel results 2016 when the gospel fruit was unprecedentedly abundant in the fervor of preaching to seven billion people, and for having a vision for the year 2017. The commemoration service on the first day of the New Year by the sacred calendar was attended by more than 3,000 church members including title and/or position holders and the Head Office staff as well as the elders who had worked for the gospel since the early days of the church. On March 12, 2017, when yellow-green buds were coming up, receiving spring sunshine, a variety of foreign languages were heard unceasingly at the Okcheon Go&Come Training Institute, where the 12th Foreign Language Bible Preaching Contest was held. The contest was attended by over 5,000 members of Zion, including university students, workers, and the pastoral staff members who have prepared themselves to speak foreign languages, hoping for overseas mission. The dedication services were held on March 7, 2017, for three churches in the northern Gyeonggi Province of Korea: The Paju Munsan Church (in Munsan-eup), the Yeoncheon Church (in Yeoncheon-gun), and the Pocheon Church (in Soheul-eup). The brothers and sisters, who had kept services in the churches located in other regions such as downtowns of Paju or Pocheon, Dongducheon, and Cheolwon, longing for the churches to be built in their regions, were now joyful to participate in the dedication ceremonies.